Art Deco collectibles (they won't qualify as antiques until they started hitting 100 years of age after 2020) are still super hot with those who appreciate this styling dating to the 1920s and '30s. This feature shows a number of varied Art Deco pieces ranging from advertising to architectural pieces. This handsome example of a soda-related collectible is made with reverse painted glass set in a metal frame in classic styling and colors from the Art Deco era circa the 1930s. 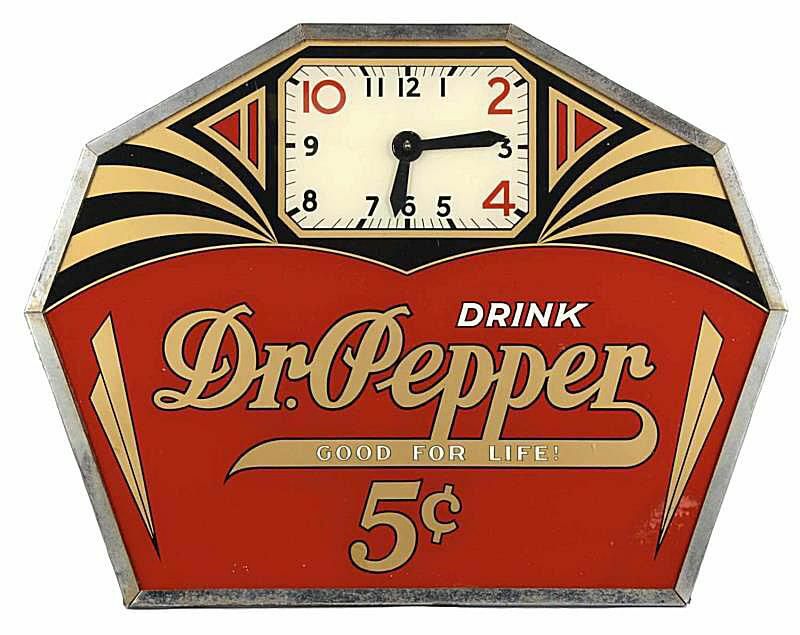 The slogan reads: "Drink Dr. Pepper Good for Life." Measuring 22-inches wide, it has an easel on back for display. Although the auction description states that it had not been tested prior to the sale, it still sold for $3,660 (not including buyer's premium) in a live webcast auction held in January of 2016 by Morphy Auctions. This mantel clock from France is made of patinated (artificially aged) metal and marble. The sleek big cat sculpture so prominent in the design is noted as a lioness in the auction description, and the age estimate is 1940 placing this piece at the end of the Art Deco period. It is a key wind clock measuring just over 24 inches long. In mint condition, it sold for $2,745 (not including buyer's premium) in a live webcast auction held in January of 2016 by Morphy Auctions. Sold as a pair, this is considered to be a very unique design for D'Argyl (marked on the bottom of each vase). Made in France. They measure 12 inches tall. Being in near mint condition, the set sold for $1,586 (not including buyer's premium) in a live webcast auction held in January of 2016 by Morphy Auctions. This great example of an architectural collectible date to the Art Deco era circa 1920's-1930's. This entry gate holds crossover collecting appeal as well since it would interest those who have a penchant for the Cadillac brand as well as fans of Art Deco and architectural design. Each side panel is 30 inches wide and the central gate is 34 inches wide. The two side panels with Cadillac logo and the center gate were sold as a lot for $5,185 (not including buyer's premium) in a live webcast auction held in January of 2016 by Morphy Auctions. This countertop theater sign made of wood has been restored to look as it did originally when new in the 1920s/1930s era. Measures 32 inches tall. As shown with Steamboat Willie print, it sold for $700 (not including buyer's premium) in a live webcast auction held in January of 2016 by Morphy Auctions. The Sparton Bluebird epitomizes the Art Deco radio. It is made with blue mirrored glass and chrome trim. Measures 14.5 inches in diameter. Even with condition issues—missing one chrome knob and the blue mirror has a few tiny spots and one small chip—this example sold for $2,250 (not including buyer's premium) in a live webcast auction held in January of 2016 by Morphy Auctions.